Includes The Optimizer Keyboard Platform Enhancement - The Optimizer incorporates many of the unique features found in the best selling Banana-Board® keyboard platform and is included with this platform at no additional charge. Dual Swivel-Out Mouse Platforms - Platforms store under keyboard tray when not in use. For Right or Left Handed Users - One or both platforms can be used. 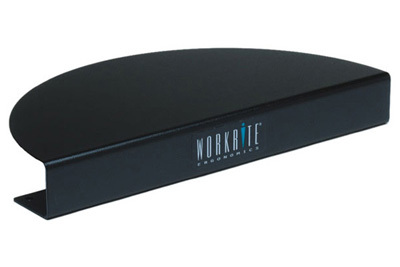 Platform Material - Ultra-Thin: Composed of 1/4" composite plastic, this is the most popular keyboard tray material. Palm Support Memory Foam covered with LeatheRite™, which has the elegant appearance and feel of fine, soft glove leather, yet has the durability and inherent stain resistance of synthetic fiber. Its porous structure makes it remarkably comfortable in any season, dissipating heat in warm weather and retaining it in cold. Front Swivel Plate Allows keyboard and mouse platform to pivot an extra 45° left or right for special mounting requirements. Easy to Install: Mounts between the arm and keyboard platform. Track Bridge: Designed for mounting keyboard arms and tracks where support beams limit the availability of flat mounting surfaces (such as benching systems or adjustable height workcenters). Attaches between the underside of the worksurface and the keyboard arm track with installation hardware provided. Available in 2 depth sizes: BMK-1-B for depths 1.12"–1.5" - BMK-2-B for depths 1.88"–2.25" BMK-1-B should be used for all installations of tracks greater than 17" on Workrite’s Essentia, Sierra HX and Sierra HXL Electric frame sets BMK-1-B should also be used for all Sierra HXL crank installations, regardless of track length BMK-2-B used with Cascade frame sets.